Thanks, Biz! I really hate food waste -- my grandma would be so proud -- and this doesn't seem at all like "leftovers." That's a great use of leftover, Jean. It looks really creamy and comforting and I love your soup bowl too. While you’re finessing those leftovers, methinks you’re passing over another leftover. That leftover idea of French fry potato soup just might carve out a new niche. This might be the best idea you never had. Only, you had it by inference. Those bits of crunchy crust could well make adding crackers to soup obsolete. Of course, just because I’m Irish doesn’t mean I know Thing One about potatoes – don’t eat ‘em, including French fries. Also I want one of those blenders! Also #2 the photo of that potato soup with the sprinkles and the cheese curl would make a great repeat pattern on a wall of a kid’s room. Angie, thanks! I have lots of china, but my most frequently used are the various white and blue-and-white ones. Excellent ideas all, Sully! And the blender is fabulous! It will tear up ANYthing! We're whole juicing fruit in the mornings and vegetables in the afternoon. But I can't even imagine life without potatoes -- it sounds almost as tragic and bleak as life without tea! I've used leftover mashed potatoes to make potato pancakes but not soup. This is a great idea and I've pinned your recipe thanks. I'm interested in reading about this new blender you have - don't we love new toys in the kitchen! Judith, thank you! I haven't quite figured this Pinterest thing out, so I really appreciate pins. Stay tuned for reports on the blender -- I'm really excited about it! Lucy, I just love it when someone thinks me clever! Thank you. It does look like comfort food at its finest! I've never heard of that kind of blender, but this is a great use for leftover potato! My favorite soup is butternut squash with curry, and each day I go out to the garden to check the ripeness of my squash! I'll have to try mashed potato soup too. I've always loved potatoes. Thanks, Judy! I love butternut squash, too. But I'm afraid I have to buy my squash at the store or farmers market. Sure hope I can garden next year! I love potato soup! It is one of my favorites and I'm always excited to come across a new recipe. Thank you for sharing this on Roses of Inspiration! Pinned. Thank you so much, HS! Appreciate the Pin as well! 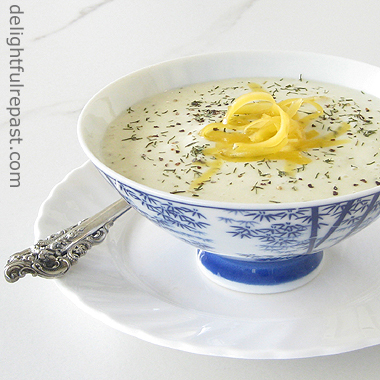 What a great idea to use leftover mashed potatoes to make potato soup!! Sort of progressing from "yum" to...well, "yum"! I have never heard of a high-performance blender, but I will read with interest your future post. Cheryl, thank you! I love that -- "from yum to ... well, yum." When asked what my favorite food is, I usually answer "mashed potatoes." Well aren't you clever, my friend :) I always have left over mashed potatoes, but never thought to use them in soup....yum! I will definitely try this recipe next time I have leftovers. Always a delight to have you at Roses of Inspiration. Hugs! Jean, you are genius, make most delicious and beautiful looking soup from left over mashed potatoes, once the weather get colder I will try this soup. Here still warm. Thanks for sharing with Hearth and soul blog hop, pinning and tweeting. Oh Swathi, how I love being called "genius"! :D But, seriously, thank you so much! Kimberly, thank you! Pins and tweets are soooo appreciated. I'll be back! Love this recipe, Jean! What a great way to use up leftover mashed potatoes and it's real comfort food too. We recently bought a high performance blender too (Vitamix) so I am looking for recipes like this. Thank you for sharing this recipe with us at Hearth and Soul. Thanks, April! I'll be posting more recipes for the high-performance blenders in the coming months. We use it every day for whole juicing. Isn't potato soup just the best? I've got fresh Colorado new potatoes that will be finding their way into a creamy soup very soon. Lea Ann, you know, I'm sure, that a lot of people have never had really fresh potatoes. They don't know what they're missing! This sounds amazing! We often have leftover potatoes, and I love potato soup. I might try incorporating some leeks into this recipe. Thank goodness for Pinterest save all of your great ideas! Carol, thank you! 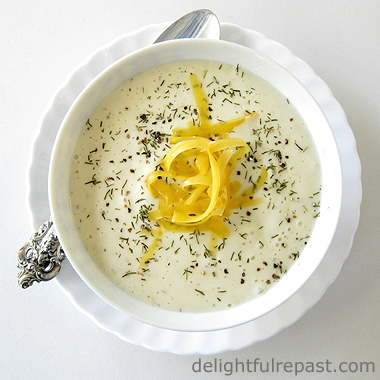 Yes, leeks are so good in potato soup! I don't quite have the hang of Pinterest, but I'm working on it. Thanks, Greg! I always make lots of mashed potatoes, too, because they're my favorite food and it just wouldn't be right to not have enough! Jean, this looks so good, and what a great idea to use leftover mashed potatoes to make soup. Thanks, Dori! Hope you like it! Kim, thank you. I just hate to waste food, so I try to think of ways to use the leftovers. Fabulous! I made far too many "make ahead mashed potatoes" for Thanksgiving and started a search for using them up. These are the mashed potatoes you make with cream cheese, milk and sour cream so they were quite tasty to begin with. I cooked the onion and celery on the stove top and added all the ingredients until hot. I then poured into batches in my very old blender and pureed, returning to stove top to keep warm. Very rich, a little goes a long way, my family loved this soup! Debbie, thank you so much! I'm so glad you liked it. I *hate* food waste and would really hate to waste mashed potatoes with those extra ingredients. And the soup doesn't scream "leftovers!"